Reinbold, L. (2018). Self-access centers and autonomous learning: Report on the Japan Association for Self-Access Learning (JASAL) conference 2017. Studies in Self-Access Learning Journal, 9(2), 90-99. JASAL (The Japan Association for Self-Access Learning) held their 12th Annual Conference/Forum on December 16th, 2017 at Kanda University of International Studies (KUIS) in Chiba. JASAL is a non-profit organization that fosters learner autonomy and self-access learning to a cross-section of educational institutions in Japan. This article contextualizes the plenary talk and selected presentations that captured the underlying themes of this conference: 1) necessity to become a social learning space for language learners, 2) necessity of structured support, and 3) necessity to assess and modify. On December 16, 2017, the 12th Annual JASAL (Japan Association for Self-Access Learning) Conference/Forum JASAL 2017 was hosted by Kanda University of International Studies (KUIS) in Makuhari, Chiba at a sprawling modern campus in the newly completed Self-Access Learning Center (SALC). 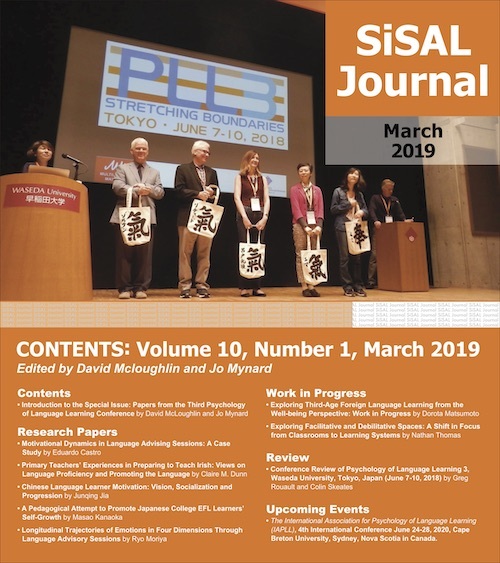 It is noteworthy that this is the third SALC on this campus, which is a testament to KUIS’s commitment to and success with Self-Access Learning (SAL), a feat coveted by many educational institutions across Japan and beyond. As evidence, the conference was attended by more than 135 participants from 61 institutions consisting of faculty, administrative staff, and students. In consideration of all of the above, the JASAL 2017 conference message was clear and illustrated by findings provided by presenters Sakai, Murray, Werner & Von Joo, Worth & Fritz and others that indicated that through ongoing efforts of teachers and administrators, Self-Access Center (SAC) use by language learners was increasing. Often to initiate the first access, teachers needed to “push” their students to the SAC by integrating coursework, and/or activities, thus easing the transition to independent learning (Croker & Ashurova, 2012; Gardner & Miller, 2014). Moreover, SACs were “pulling” attendees by offering services that met the particular needs of relevant service users, and as a result, the numbers are increasing. In fact, this growth in SAC use has fostered the formation of communities where learners with mutual learning goals have convened. The conference began at 10:00 AM with opening remarks by the current JASAL President, Hisako Yamashita, who spoke on the history and mission of JASAL. Dr. Jo Mynard of KUIS continued with a brief history of their self-access learning program and stated that it was necessary to facilitate autonomous learners with their learning processes and concluded that the SALC had evolved into a social “place” for interdependent language learning, where independent learners could learn together and from each other. Dr. Garold Murray of Okayama University gave his plenary talk on how the emersion of a social dimension to SACs can bring additional benefits and add value. The title of his speech, “Self-access environments as self-enriching complex dynamic ecosocial systems” was representative of the metamorphosis of the concept of SAL and SACs. After starting two SACs, first in Akita and later the L-Café in Okayama, he realized that the SAC, which was initially made for independent learning, was transforming itself into a place for new relationships of individuals with shared learning goals or mutual interests. Complex dynamic systems were emerging and bringing new affordances and opportunities to local and international students. Murray conducted three research projects to examine the social learning space, a five-year ethnography, a multiple-case study, and a narrative inquiry. Murray explained that anyone could start a SAC. The L-Café began as a vision of a man who wanted a place for students to converse in English in a comfortable environment which became a reality. When designing the interior of the SAC, randomness and distributed control can be more attractive to students, since space “communicates,” and a classroom-like atmosphere can deter users. At the L-Café, gradually Communities of Practice (CoP) came together, and opportunities for language learning increased. Learning was not necessarily intentional and was a natural outcome. Students began to teach classes and organize events; international students came to make friends with Japanese students, and a dynamic eco-social system was accruing. Murray concluded that for SACs to provide benefits, the space must allow for organic growth through its use by the people. The self-access center is transforming itself from a place for self-study into a space for interactive social learning. In total, there were 43 individual and group presentations that provided extensive practical information on the conference themes, as well as 10 poster presentations. Intermixed with the presentations and poster sessions was a self-guided tour of the KUIS SALC assisted by a 3D augmented reality monkey Saruo on an ‘app’ for smartphones that Erin Bonner and Erin Frazier created to introduce facilities and location-based information. This tour opportunity provided much-needed context for the presentations and poster sessions. Finally, the conference ended with a closing reflection session and networking opportunity. Three reoccurring themes for self-access centers and autonomous learning at the conference were: 1) necessity to become a social learning space for language learners, 2) necessity of structured support, and 3) necessity to assess and modify. The following summaries of presentations are organized under these running themes. The first theme of the 2017 JASAL conference was the necessity of SACs to grow into social hubs which give students “emotional and learning support” (Mynard, 2016, p. 334). For SACs to fulfill their goal of facilitating learner autonomy, they need to become places where Communities of Practice (CoP), “groups of people who share a concern, a set of problems, or a passion about a topic, and who deepen their knowledge and expertise in this area by interacting on an ongoing basis” (Wenger, McDermott, & Snyder, 2002, p. 4) were being formed. In their presentation Daniel Hooper, Michael Burke, Jo Mynard and Phillip Taw of KUIS explained how they observed student interactions in their English Lounge (EL). For ten times for 90 minutes over one week, they conducted 15 interviews with different users viewed from the CoP framework to investigate what role the lounge had in defining this community. The literature on CoPs has established that for a CoP to exist three pillars are required—the community, the shared domain, and the practice (Wenger-Traynor & Wenger-Traynor, 2015). The EL satisfied these requirements. The community consisted of student members who formed relationships to help each other. They worked cooperatively helping and being helped by others. Emotional bonds and friendships took root. The shared domain was the lounge that was specifically designed for learner comfort. First, though teachers are on duty, students are not forced to use the lounge, not forced to speak English, nor guided on use of the SALC even though support was available. Next, the furniture is comfortable including “the yellow sofa” on which the frequent “sitters” were observed. As regards the third pillar, the practice, that was satisfied by the fact that students worked together to improve their language skills. Students worked interdependently and were on the path to becoming autonomous learners. Students invested in the community by taking ownership of the space and language policy, and socializing with new members to create a learning network. Clearly, the importance of establishing social learning environments in SACs, whether through CoPs or by other means is more than worthy of consideration. Hearing about and learning from the SAC experiences of the presenters provides conference attendees with knowledge and ideas that can be related to one’s own SAC involvement. This point is well-illustrated by the presentation’s content on the importance of creating social learning spaces for learners as a necessity for immediate, short-term and long-term success of SACs. Learners need to have structured training or learning advisors to prepare them to become SAC users and autonomous learners. Providing a SAC with learning resources, does not automatically lead to independent learning (Cooker & Torpey, 2004; Swanson and Yahiro, 2012), and even though self-access means independent learning, and it may seem contradictory to integrate use of the SAC into a course curriculum, links between the SAC and classroom are a necessity (Gardner & Miller, 2010). Students need training on how to take control of their learning before they can take control of their learning (Thompson & Atkinson, 2012). This structured ‘push-pull training’ scaffolds students’ transitions from the structured teacher-led activities in the classroom to student-led activities in the SAC (Croker & Ashurova, 2012). The presentation reports that follow address the necessity of structured support to initiate users with autonomous learning. Alexander Worth and Erik Fritz reported on how they increased student use of the interactive space in the Language Learning Center at Osaka Institute of Technology through the implementation of a CEFR-J-based speaking program. In 2014 they were faced with challenges. Even though there was a relatively high number of one-time users with approximately 86.9% of reservations during the first semester, there was a decrease to 66.5% in the second. Worth and Fritz believed the challenges they faced were rooted in the lack of structure of their SAC operation, and that there was a necessity to incorporate learners’ vocabulary and grammar development. Therefore, they decided to create a 15-minute structured speaking program based on CEFR-J “can-do statements” which consisted of four levels and eight lessons per level. SAC users first made reservations for one-to-one meetings with teachers to assess their individual levels, and then selected a level-appropriate worksheet. During the consultation session, the student and teacher worked through the tasks which was followed with a selection of the next worksheet for the next session. As a result, they found that the speaking program became more popular than the “free talk” sessions had been. The program was reviewed yearly for improvements which resulted, in 2015, in an increase in reservations in the first semester (88.7%), and again in the second semester (92.6%). Reservations for consultation services in the first semester of 2017 reached 90%. They concluded that student use of SACs could have increased due to the structural element. Chelsea Schwartz described the situation of the English Consultation Room (ECR) at Soka University. In order to enable the approximately 700 students who use the ECR annually to become autonomous learners, which they defined as learners who can set goals, plan learning, reflect and evaluate, and ask questions, ECR advisors provided a structured approach. The advisors implemented 30-minute, one-on-one sessions for assistance on standardized English tests, the four skills, grammar, and vocabulary. During these sessions, students were encouraged to set goals and make study plans. For example, if a student mentioned that s/he wanted to improve TOEIC scores, the tutor would encourage him/her to set a specific target score and date. Students were also encouraged to reflect on their previous learning experiences, and then received suggestions on appropriate study methods and strategies. These advisors acted as facilitators and guided students towards finding answers instead of merely giving them. In keeping with this approach, the advisors followed a similar process as the students for their own development: they observed each other, reviewed reports, reflected on their methods, and also received additional training and advice from experts. Thus, the element of adding structure permeated the process adopted in the ECR towards improving services for users. Akiyuki Sakai of Meijo University examined learning support session records: a work log kept by teachers/learning advisors working in the designated self-access learning area. Sakai found a pattern where some learning advisors received more casual or drop-in modes while others had more sign-ups. Learning advisors taught 60-minute classes on various topics every week, and also worked at a learning support desk where students could receive learning advice, speaking practice, and writing support. Students could select three types of meetings with advisors, casual (outside of scheduled hours and in designated locations), drop-in, or sign-up. Learning advisors ept a log of the time spent, type of meeting, purpose, focus of advising, and main language used. Students who came for casual conversation were likely to be one-time users, while students who signed up tended to be repeaters. Either the sign-up sessions made students want to return or students preferred scheduled appointments. Sakai concluded that students wanted to receive advice on language learning and practice speaking, and that learning support from advisors is critical to enable students frequent use of SACs. There is profound takeaway regarding the efficacy of various levels of structure applied as a response to multiple challenges experienced in an assortment of SACs as evidenced in the presentations given during the conference. Providing structure to a self-access learning program should not be viewed to be in conflict with autonomous learning: they should co-exist. The real issue rests in finding an appropriate balance between the two. In other words, there exists a continuum of structure that needs to be applied based on needs. SACs and learning advisors need to re-assess and re-evaluate their goals and processes to meet the changing needs of learners and their responses to their learning environment. Swanson and Yahiro (2012) point out that “through careful and ongoing analysis of the needs of the learners, a SALC can develop as a rich environment to foster language growth within institutions but can only do so if viewed as a work in progress and not as a completed project” (p. 121). The success of many SACs may hinge on their ability to self-assess and adapt their operations. The presentation reports that follow address the necessity of on-going assessment and subsequent adaptation of SAC policies and processes. Katherine Thornton of Otemo Gakuin University focused on the shift in SAC use towards social interaction rather than self-directed study. She presented data from a survey conducted at two self-access centers from teachers, learning advisors, conversation facilitators, administration staff, and students vis-à-vis language policy. For example, in selected areas in the Language Learning Spaces (LLS), only the target language (TL) could be spoken, and in other designated areas, advisors gave advice on language use or on test preparation where use of TL was not mandatory. When practitioners were asked about the current policy, they reported that a TL-only policy would be ideal. Nonetheless, because the LLS was for multi-language use and learners of Japanese practiced their TL in this space, TL was not strictly enforced. Moreover, Japanese students’ with lower English proficiency may hesitate using the LLS, and staff may feel uncomfortable speaking L2 to Japanese teachers or tutors. Further, students could ignore the TL-only policy for private interaction in booths, and if so, then how would this be ‘policed’? Students who frequented the SAC suggested that the occasional use of L1 with low-level students, who wanted to socialize in the LLS could lead to English improvement even if they were not confident in their English ability. Thornton concluded by saying that to acquire L2, integrating L1 to scaffold learning does have merits. Learners need support and must reflect upon their purposes to decide whether they are using Japanese to facilitate TL improvement or are relying on L1 for convenient social use. Thus, it would appear that SACs must have a flexible policy on the L1/TL use. Richard Hill and Robert Primeau of Meijo University explained the value of the conversation partner (CP), the “active facilitator of conversation” with students in SACs and tips on how to work with language learners. When speaking with students, CPs usually covered various parts of conversations: first, introduction and greetings; second, small talk; third, conversation on two topics; and finally, conversation endings. Hill and Primeau stressed that CPs should be aware and reflect upon themselves as CPs. For example, were the conversations balanced and not like an interview? At times when students seemed to prefer being alone or chatting with friends, talks should not be forced. By making new students feel welcome and keeping records of conversations to remember names and topics discussed, CPs can create a rapport with them. When relaxed, students tended to be more willing to communicate and speak more. More tips for CPs included trying to build a dialogue with students instead of asking all the questions on a variety of topics in one session, to give incentive for them to continue the conversation and return. Other suggestions were to manage a sudden increase of students who come to the SAC and to accommodate students with different levels of English proficiency. Backup activities such as card games or vocabulary paraphrasing games could also be used. In summary, CPs, like SACs need to be flexible in accommodating the individual and fluid needs of English language learners. One highlight of the conference was a 15-minute presentation by Tomoya Shirakawa, who is an undergraduate student at Kanda University of International Studies. He reported on a qualitative study on Language Tutor Autonomy (LTA) using interviews with paid student tutors to identify how teaching as tutors influenced their learning as students. Students who had completed an interview and completed a training session could become paid tutors. Tutors taught ten sessions per semester on TOEFL, TOEIC, and Basic English Program to fixed groups of students. Eleven participants were asked about difficulties they experienced, how they prepared for the sessions, topics covered, and self-improvement. Tutors found a “wall” between themselves and tutees due to their position in-between teachers and learners. They also noticed that they learned as they taught. For example, they realized that instead of asking closed questions with yes-no answers, asking an open-ended question such as, “Why did you select this choice?” gave a more accurate picture of the student’s understanding. Shirakawa ended by stating that more research on LTA could be applied to self-access learning. Once again, assessing actions at a policy or personal level and making adjustments based on sincere reflection reaps rewards for teachers, advisors, tutors and students, alike. During the past decade, the SAC has transformed itself from being a space for self-directed individuals to access physical language learning materials, into a social environment for both language-learning materials and learner-initiated learning. SACs are continually evolving under the guidance of dedicated educators to enhance autonomous learning. Clearly, after giving much thought into the short-term and long-term vision for a SAC, context-specific decisions (goals, services, processes and plans for sustainability) must be born to create a legitimate working model. The organizers of the JASAL 2017 Annual Conference were successful in enabling attendees to participate in a well-managed stress-free environment. The JASAL 2017 Conference included a plethora of information for those who wanted to start a SAC, search for solutions to specific new challenges, or exchange ideas. Much detailed and up-to-date information, both theoretical and practical, regarding autonomous learning was gleaned from the memorable presentations and engaging discussions within a short span of time. Lorraine Reinbold is a professor in the Faculty of Education at Hakuoh University. She enjoys finding new ways to stimulate and motivate learners and is in the process of revamping the current SALC into the new Language Commons with a fellow educator, Todd Leroux. Gardner, D., & Miller, L. (2014). Managing self-sccess language learning. Hong Kong: City University of Hong Kong Press.